Who doesn’t love puppies? Experts consider puppyhood, particularly the first three to four months, to be the most important period of a dog’s life. In that short window, a dog’s experiences shape their views about what’s safe and what’s scary—opinions that can be hard to change later on. That’s why training, socialization, and building good habits are so important for puppies. Check out the adorable puppy pictures below and read on to see if you have what it takes to raise a happy, healthy puppy! Learn to get along with other dogs if he has positive interactions with them. A dog who misses out on these interactions—part of what trainers call socialization—can grow up to be fearful or aggressive around other canines. Learn to be safe and friendly around humans if he has lots of positive interactions with people of all sorts. Without these interactions—also an important part of puppy socialization—a pup can grow up to be fearful or aggressive with humans. This goes for all breeds. Get used to the hustle and bustle of family life. If you expose your pup to dishwashers, vacuum cleaners, other pets, cars—basically all the things he’ll be living with as a family dog—he’s more likely to be relaxed around those things as an adult. Go slowly when introducing anything new, and make sure it’s fun or, at the very least, not scary for the pup. Have “puppy rushes,” or “zoomies.” These short, sudden bursts of running, barking, jumping, spinning, and grabbing things with his mouth usually happen a few times a day and last a few minutes. Get his adult teeth around three to six months of age. Most puppies will chew anything and everything they can get their jaws on to relieve the discomfort of teething. Ice cubes or special chew toys that you can pop in the freezer will ease pain and give your pup something safe to gnaw on. Possibly eat poop. Dogs of any age can have this gross habit, but it’s more common in puppies. Be vigilant about scooping poop! All dogs develop at different rates, with small breeds generally developing the most quickly, large breeds more slowly, and giant breeds being the late bloomers. For many dogs, five or six months and younger is considered puppyhood; then your pup enters adolescence. Puppy-proof before you bring your new friend home. Protect both your pup and your belongings. 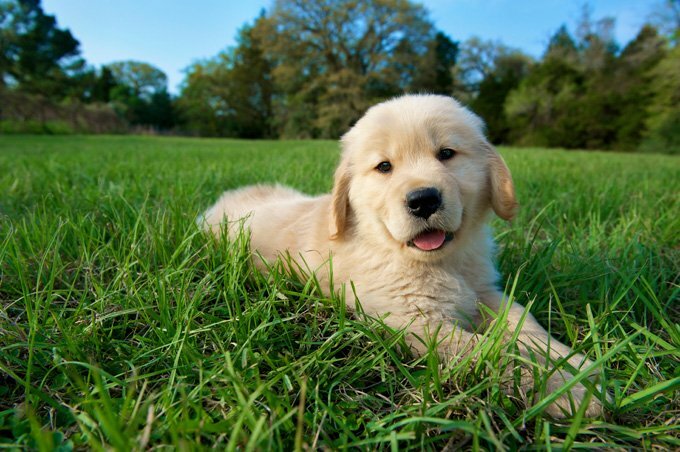 Don’t take a pup away from his canine family before eight weeks of age. His mom and litter-mates teach him a lot about how to get along with other dogs during this period. Your pup needs vaccinations to protect him from serious, and sometimes fatal, diseases. Most pups get shots that start sometime between six and eight weeks and end at about the twentieth week. Young pups shouldn’t walk in public places because they’re still vulnerable to dog diseases. Ask your vet when your pup will be ready to go out and about, but it will probably be sometime around four to six months. Introductions to new situations and things should be gradual and pleasant. Build positive associations. Avoid scaring your pup. Anything that spooks them—particularly around weeks eight through 11, which is considered a fear imprint period—can turn into a lifelong phobia. You can spay or neuter your pup at age six to nine months, though you must ask your veterinarian for advice. Spaying and neutering can cut a dog’s risk of several diseases and prevent problems such as marking and escaping. Start training as soon as your pup comes home. In fact, a puppy kindergarten class is an excellent way to get your pup used to being around people and dogs. Many classes let puppies enroll as young as eight to 16 weeks of age. Don’t punish your pup. Yelling and hitting doesn’t teach a dog of any age how to behave, but it’s especially unfair to a young puppy who’s still trying to figure things out. Train your pup and be consistent about house rules, but also be gentle. Don’t let your dog do anything as a puppy that you don’t want him to do as an adult. If you lavish your pup with affection and pets when he jumps up on you, he won’t outgrow the habit once he’s an adult. 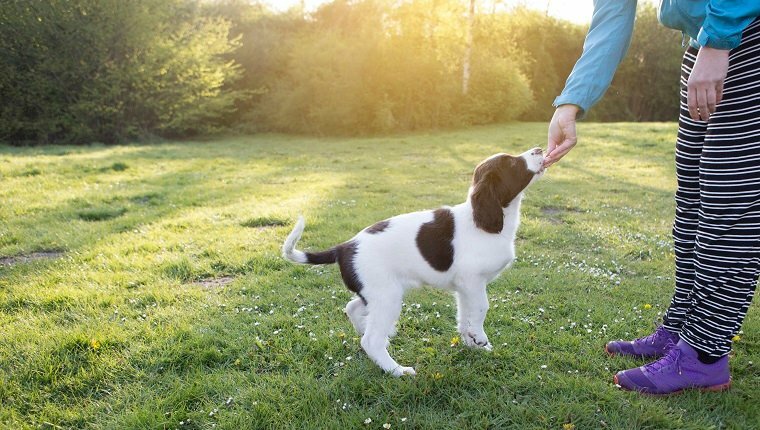 Teach your puppy where to eliminate and what to chew right away to prevent bad habits and establish good ones. Start housetraining as soon as you bring your puppy home. Keep him supplied with plenty of chew toys (stuff them with kibble and treats to entice him to chew) so he understands to gnaw on them, not on your belongings. Growing puppies need more nutrient-dense food than adults. Check labels to make sure your food is formulated for puppies. Avoid letting your puppy run and jump on hard surfaces, such as concrete; it can harm his developing body. Wait until your dog’s a year to 18 months old before you jog or run with them. Prepare for a personality change. An affectionate puppy can turn aloof in adulthood; a pup who played well with others may start giving other dogs attitude. This is one drawback to getting puppies rather than adults. With an adult, what you see is what you get, whereas a puppy may surprise you. Bottom line: Raising a puppy is a big commitment. You need to give him lots of attention, training, and socialization. Without this care, your pup may develop behavior problems that are hard, or even impossible, to treat.